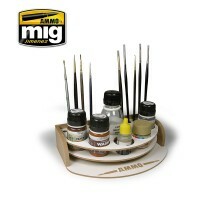 Wooden organizer for your work spaceDesigned to hold your paints, accessories and toolsCaution! It needs assembly. 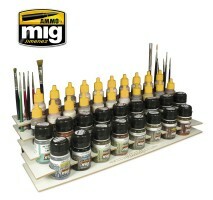 For assembly you need white glue/wood glue!.. 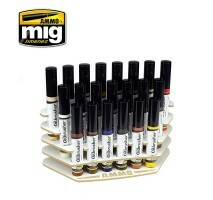 Wooden organizer for your work space, can be mounted on wallDesigned to hold 17ml paint bottles (Ammo acrylic type and equivalents) Can hold 60 bottles, shelf dimensions 40 x 30 x 6.5 cmCaution! It needs assembly. For assembly you need white glu.. 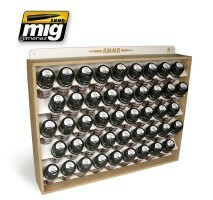 Wooden organizer for your work space, can be mounted on wallDesigned to hold 35 ml Ammo bottles or equivalentsCan hold 45 recipients, dimensions 40 x 30 x 6.5 cmCaution! It needs assembly. 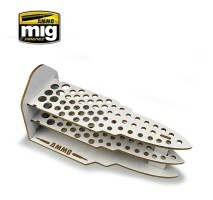 For assembly you need white glue/wood glue!.. Wooden organizer for your work space, can be mounted on wallDesigned to hold 10ml Tamyia bottles or Gunze/ Mr. Hobby jars with 34 mm diameter Can hold 54 bottles, shelf dimensions 40 x 30 x 6.5 cmCaution! It needs assembly. For assembly yo.. 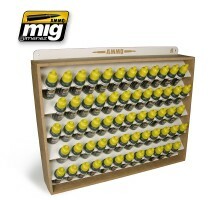 Wooden organizer for your work spaceDesigned to hold Ammo oilbrusher paint bottles Can hold 21 bottles, shelf dimensions 9 cm (height) x 20 cm (width) x 11 cm (depth)Caution! It needs assembly. For assembly you need white glue/wood glue!.. A useful bullet-shaped brush and tool organizer, perfectly sized for your workbench, provides access to your favorite modeling tools easily every time. 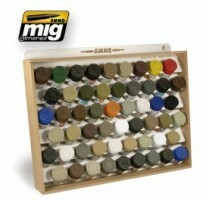 The organizer features 25 storage slots with a 6mm diameter, 27 of 8mm and 7 of 11mm. This allows ..